At the moment, I’m designing the projects for my next book. 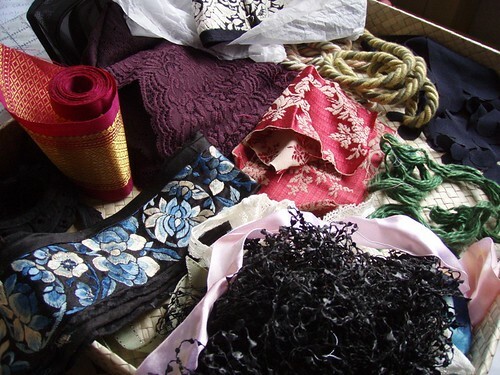 For me, part of the design process involves going through my heaps of fabric and other bits looking for the right inspirational bit. It also generates another necessary activity -that of tidying up. My studio is permanently in a state of fabric-induced chaos. I have never pretended to be a tidy person. 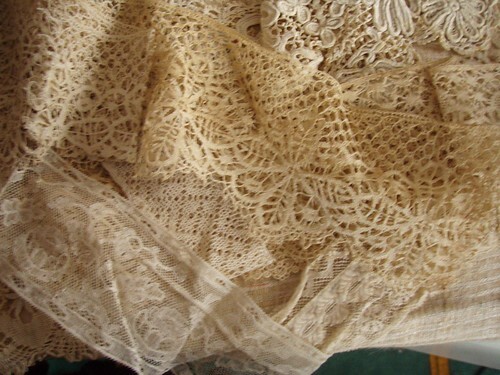 Today’s design challenge involved vintage lace. I went though the box of lovely things given to me by some friends last year. 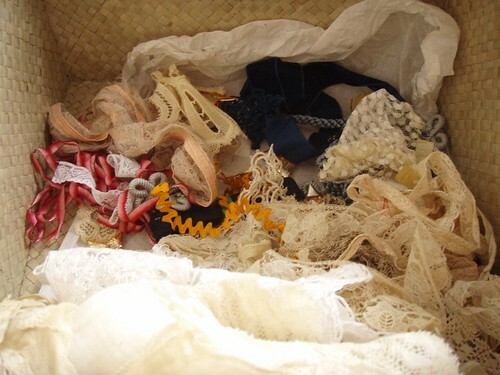 Then I remembered another box of lace, trimmings, embroidery and all sorts of loveliness. Where on earth are they hiding. A few trips up steps to explore boxes on the top shelf failed. The cupboard? Surely not, just random junk in there. Ah, the box under the table. I remember, vaguely, packing it into one of my nice woven rush boxes. I opened said box. “Packing” you say? Hmm. Looks more like I did some “fling it in here for now and sort it out and pack it properly soon.” And promptly forgot it! So it was a nice treat to unpack, sort and enjoy the contents. Click on the photo and go to Flickr to see my notes on what is in this selection. The not-so-tidy box of stuff. 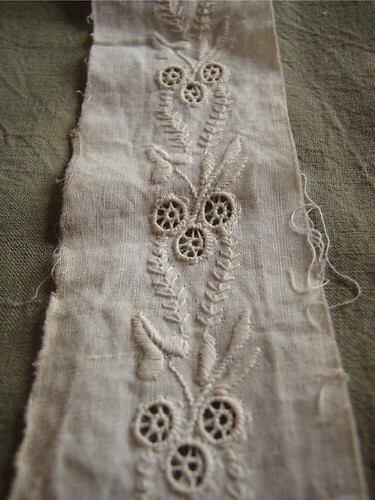 I do normally pack vintage and delicate things carefully – years of training working with museum costume collections. I am a bit ashamed of this jumble! This is an enduring favourite, I’ve always loved the simplicity of the design. What lovely laces – and what a great present to yourself!